Abstractions used in biology can be divided into three levels, shown in Fig.1. The level ordinarily employed by practitioners consists of what can be observed, measured and affected empirically. Recently, this is termed ‘omics’, expressed by various disciplines as genomics, proteomics, metabolomics, biomics and phenomics. Rich tools abound at this level. Being quantitative, omics data is readily handled by computerized systems. By assigning semantics and implied causality, biologists can elevate it to the next ‘logical’ level to devise hypotheses to develop theories to then be tested against more data. Usually, life science is conducted in the cycle between these two levels: theorize, experiment, measure, re-theorize. A problem is that observations in this ‘life cycle’ are permeated by prior theory, which defines the concepts being measured. This limits the scope of hypotheses and the derived theories. Evolutionary progress is well served, but true insight is limited. This ‘corrupting’ embeddedness of theory in measurement and observation was criticized by von Bertalanffy (, p. 25, organismic vs. mechanistic approaches to general system theory). Summing up reductionist theories does not sufficiently inform system level or paradigm shifting theories because fundamental concepts will be interpreted in a new context. A view of life is needed that includes the way new system-level identities and interactions emerge and become defined. To address this, we suggest a third, epistemological level – Integral Biomathics – which addresses the living entity as a whole and Rosen’s question about (the meaning of) “life itself” [1-2] while preserving the utility of the ‘lower’ levels. The rationale for the new level is that living systems have essential system dynamics, which overlap and often do not have clear physiological expression. To advance biology and address outstanding challenges, sustainable models are needed to unite the three conceptual levels. On the one hand, complex information and energy flows through living systems at multiple scales from molecules through cells, and tissues to organ(ism)s and (eco)systems. All need to be coherently comprehended to adequately address challenges like developmental and epigenetic disorders, autoimmune diseases, extirpating a virus outbreak, etc. On the other hand, the current state of bioinformatics will not support the development of new theories and their transition to everyday practice. Combined with addressing vexing system-level disorders, the problem is more demanding when adding the challenges of personalized medicine. We propose to address the third, epistemological level in the context of real problems and integration with current bioinformatics. Our approach is formal, goes beyond the present science and has been reviewed by peers in essential elements. We will develop advanced visualization, modeling and simulation tools. reducing the need for animal models in research. generation and validation of an overarching and easily comprehensible model for personalized medicine to target more reliable diagnosis and therapy. The approach proposed here is theory-driven and mathematical, i.e. (data) deductive. Data is integrated a posteriori to validate the models. The ultimate goal pursued with this work is the development of a highly sophisticated decision support system for life sciences and medicine. The goal of the Integral Biomathics collaboration is to examine suitably eligible applications of mathematics and computation to biology. That is, the participants are looking for patterns in biology – called diagrams in mathematics – that can be informed by computable mathematics. Empirically observed relationships between the elements at many different levels must be preserved in all transforms among levels. It is not just making higher mathematics and theoretical computer science available for studying biology in a new way, rather a matter of finding just what (and which) kinds of fields fit in the problem descriptions and ‘solve’ them. As a result, Integral Biomathics is substantially different from systems biology today [4, 8-12] and claims to be a new, extended branch of theoretical biology as it was envisioned some 50 years ago . It comprises not only the relational aspect of theoretical biology, but also its experienced, first person (phenomenological) aspect in the models. Most characteristic is that it differentiates the proposed work from mainstream systems approaches. These either ignore Aristotle’s final causes (and hence the reality of life) or reduce them to nothing more than the effect of cybernetics. The larger project reaches beyond assumptions from current quantitative and experimental science to consider what and whether it is worth being investigated. It not only pursues Schelling’s call for a new dynamic mathematics that allows radically new theories adequate to life to be developed (, p. 9), but also makes this practically relevant with the further exploration of Rosen’s relational biology [26-27] through relational mathematics  and multivalent logic rooted in AI . We should keep in mind that there are also incomputable branches of physics and biology. a dynamic category theory for multi-level, multi-agents, ME(N)S [20-21]. This formal framework represents a sophisticated hybrid design methodology and framework for modeling the concepts and dynamics of multi-level complex living systems. The result of this effort will be demonstrated by a practical implementation in bioscience , Fig. 2. Fig. 2: The potential contributions of Integral Biomathics and WLIMES to personalized medicine and virtual oncology through iterative object model and process simulation enhancement with real data: life cycle steps 5-9. A novel visual-haptic tool will be developed to allow scientists and practicing physicians to visually theorize, interact with ideas and experience mathematical operations in a virtual and augmented reality context. Its major advantage is the capability for smooth integration of mathematical deductive models into the traditional workflow of conventional inductive and abductive diagnostics and therapy. Researchers will, jointly develop models from observed phenomena iteratively enhanced with real data. 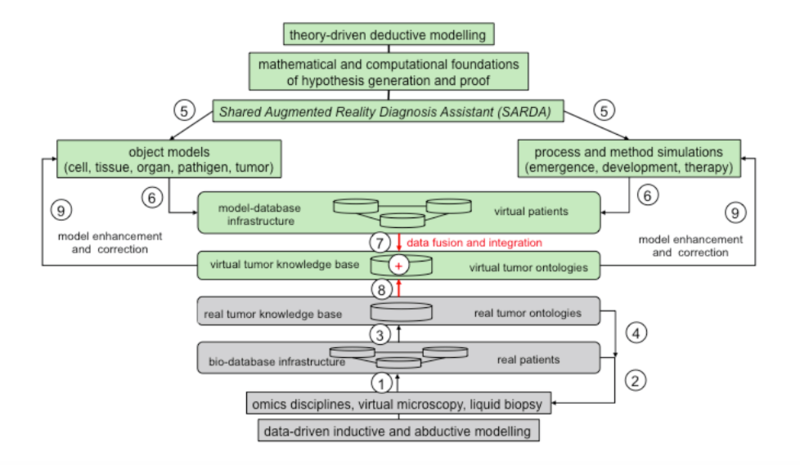 We envision a prototype implementation of the WLIMES formalism for virtual oncology as a Shared Augmented Reality Diagnosis Assistant (SARDA), illustrated in the top green colored side of Fig. 2. This tool will help physicians develop models of complex biological objects, their underlying processes and methods for their understanding and treatment. The suggested system architecture on the left hand side of Fig. 2 goes beyond the present state of technology used for theoretical research in life sciences and personalized medicine. Equipped with this toolset, physicians will be able to address new challenges in their research practice. For instance, a key problem in tumor genesis and tumor dynamics is how the different tumor stem cells relate morphologically and biochemically among themselves and their environment. Obtaining a general system view from a multitude of elementary dynamics requires the use of abstract biomathematical tools such as the proposed relational mathematics. These achieve an elegant system-state control based on purpose-driven visualization and affordances of objects and processes at the levels of Fig. 1. The core of the suggested WLIMES solution is its visual language and calculus (VLC) embedded in an SARDA interactive environment. This innovation can be applied in other fields such as virtual oncology, virology, immunology and such. A goal is for this innovation to lead a new generation of analytical and modeling tools urgently needed for creative and effective research not only in life sciences and medicine, but also other domains. This work proposal is novel and does not continue a currently funded effort. Rosen, R., 1991. Life Itself. Columbia Univ. Press, New York, ISBN 0-231-07565-0. Rosen, R., 1999. Essays on Life Itself. Columbia Univ. Press, New York, ISBN: 0-231-10510-X. Simeonov, P. L. 2010. Integral Biomathics: A Post-Newtonian View into the Logos of Bio. Biophys. Mol. Bio. Elsevier, ISSN: 0079-6107, 102(2/3):85-121. DOI: 10.1016/j.pbiomolbio.2010.01.005. http://arxiv.org/abs/cs.NE/0703002. http://dx.doi.org/10.1016/j.pbiomolbio.2010.01.005. Simeonov, P. L., at al. 2012. Stepping Beyond the Newtonian Paradigm in Biology. Towards an Integrable Computational Model of Life: Accelerating Discovery in the Biological Foundations of Science. INBIOSA White Paper. In: Integral Biomathics: Tracing the Road to Reality, Springer-Verlag, Heidelberg, ISBN-10: 3642281109; ISBN-13: 978-3642281105. http://www.cs.stir.ac.uk/~lss/recentpapers/INBIOSAWhitePaper(BookVersion).pdf. Simeonov, P. L., Gomez-Ramirez, J., Siregar, P. 2013. On Some Recent Insights in Integral Biomathics. Biophys. Mol. Bio 113(1):216-228. Special Theme Issue on Integral Biomathics: Can Biology Create a Profoundly New Mathematics and Computation? Elsevier. ISSN: 0079-6107. DOI: 10.1016/j.pbiomolbio.2013.06.001. http://arxiv.org/abs/1306.2843. http://www.sciencedirect.com/science/article/pii/S0079610715001285. Simeonov, P. L., Cottam, R. 2015. Integral Biomathics Reloaded: 2015. Biophys. Mol. Bio 119(2):728-733. Special Theme Issue on Integral Biomathics: Life Sciences, Mathematics, and Phenomenological Philosophy. Elsevier. ISSN: 0079-6107. http://arxiv.org/pdf/1505.05724v1.pdf. http://www.sciencedirect.com/science/article/pii/S0079610715001285. Simeonov, P. L., Smith, L., S., Ehresmann, A. C. (Eds. ), 2012. Integral Biomathics: Tracing the Road to Reality, Springer-Verlag, Heidelberg. ISBN-10: 3642281109; ISBN-13: 978-3642281105. OCLC WorldCat Number: 800365119. http://www.springer.com/de/book/9783642281105. Wigner, E. P. 1960. The unreasonable effectiveness of mathematics in the natural sciences. Comm pure app. math, 13, 1-14. also in: in G. Emch (Ed.). Philosophical Reflections and Syntheses, 1995, Springer, 534-548. Bard, J., Melham, T., Noble, D., 2013. Editorial. Epilogue: Some conceptual foundations of systems biology. Biophys. Mol. Bio. 111(2-3): 147–149. Hoffman, W. C. 2013. Mathematics for Biomathics. Biophys. Mol. Bio. Special Theme Issue on Integral Biomathics: Can Biology Create a Profoundly New Mathematics and Computation? 113(1):179-180. Elsevier. ISSN: 0079-6107. Salthe, S. N. 2013. To naturally compute (something like) biology. Biophys. Mol. Bio. Special Theme Issue on Integral Biomathics: Can Biology Create a Profoundly New Mathematics and Computation? 113(1):57-59. Elsevier. ISSN: 0079-6107. Noble, D. 2015. Preface. Mathematics and Biology: The ultimate interface? Biophys. Mol. Bio. Special Theme Issue on Integral Biomathics. Life Sciences, Mathematics, and Phenomenological Philosophy. 119 (3): 205-207, ISSN: 0079-6107. Waddington, C. H. 1968. Towards a Theoretical Biology. Nature. Vol. 218. 525-527. May 11. 1968. Ehresmann, A. C., Simeonov, P. L. 2012. WLIMES: Towards a Theoretical Framework for Wandering Logic Intelligence Memory Evolutive Systems. In: Integral Biomathics: Tracing the Road to Reality, P. L. Simeonov, L. S. Smith, A. C. Ehresmann (Eds. ), Springer-Verlag, ISBN-10: 3642281109; ISBN-13: 978-3642281105. https://philpapers.org/archive/EHRWTW.pdf. Simeonov, P. L., Ehresmann, A. C. 2017. Some resonances between Eastern thought and Integral Biomathics in the framework of theWLIMES formalism for modelling living systems. Progress in Biophysics and Molecular Biology. Special issue on Integral Biomathics: The Necessary Conjunction of the Western and Eastern Thought Traditions for Exploring the Nature of Mind and Life. ISSN: 00796107. Vol. 131C. Elsevier. https://philpapers.org/archive/SIMSRB.pdf. https://www.ncbi.nlm.nih.gov/pubmed/28603061. http://www.sciencedirect.com/science/article/pii/S0079610717301141. Simeonov, P. L. 2017. Towards a First Implementation of the WLIMES Approach in Living System Studies Advancing the Diagnostics and Therapy in Personalized Medicine. Biosystems. Elsevier. ISSN: 0303-2647. Vol. 162. https://doi.org/10.1016/j.biosystems.2017.10.001. https://www.ncbi.nlm.nih.gov/pubmed/29042301. https://arxiv.org/pdf/1710.03571.pdf. Simeonov, P. L. 2002b. The Viator Approach: About Four Principles of Autopoietic Growth On the Way to Hyperactive Network Architectures, Annual IEEE Workshop on Fault-Tolerant Parallel and Distributed Systems (FTPDS’02) | 2002 IEEE International Symposium on Parallel & Distributed Processing (IPDPS’02), April 15-19, 2002, Ft. Lauderdale, FL, USA, IEEE Computer Society, Washington, DC, USA, 320-327, ISBN:0-7695-1573-8. DOI: 1109/IPDPS.2002.1016528. http://ieeexplore.ieee.org/iel5/7926/21854/01016528.pdf. Ehresmann, A. C., Vanbremeersch, J.-P. 2007. Memory Evolutive Systems: Hierarchy, Emergence, Cognition. Elsevier Science. ISBN-10: 0444522441; ISBN-13: 978-0444522443. Ehresmann, A.C., Vanbremeersch, J.-P. 2009. MENS, a mathematical model for cognitive systems. Journal of Mind Theory. 0(2):129-180. Simeonov, P. L., Gare, A., Matsuno, K., A.U. Igamberdiev (Eds.) The Necessary Conjunction of the Western and Eastern Thought Traditions for Exploring the Nature of Mind and Life. Special Theme Issue on Integral Biomathics J. Progress in Biophysics and Molecular Biology. vol. Vol. 131C. Elsevier. ISSN: 0079-6107. http://www.sciencedirect.com/science/journal/00796107/131:. Simeonov, P. L., Gare, A., Rosen, S.M. (Eds.) Life Sciences, Mathematics, and Phenomenological Philosophy. Special Theme Issue on Integral Biomathics J. Progress in Biophysics and Molecular Biology. Vol. 119, Issue 2. Elsevier. ISSN: 0079-6107. http://www.sciencedirect.com/science/journal/00796107/119/3. Simeonov, P. L., Matsuno, K., Root-Bernstein, R. S. (Eds.) 2013. Can Biology Create a Profoundly New Mathematics and Computation? Special Theme Issue on Integral Biomathics. Journal Progress of Biophysics and Molecular Biology. Vol. 113, Issue 1 (September 2013). ISSN: 0079-6107. http://www.sciencedirect.com/science/journal/00796107/113/1. Gare, A. 2013. Overcoming the Newtonian paradigm: The unfinished project of theoretical biology from a Schellingian perspective. Biophys. Mol. Bio. Special Theme Issue on Integral Biomathics: Can Biology Create a Profoundly New Mathematics and Computation? 113(1):5-24. Elsevier. ISSN: 0079-6107. Rosen, R., 1958. A relational theory of biological systems. Math. Biophys. 20, 245-260. Springer-Verlag. ISSN: 0092-8240 (Print) 1522-9602 (Online). Rosen, R., 1959. A Relational Theory Biol. Syst. II. Math. Biophys 21, 109-128. Springer-Verlag. ISSN: 0092-8240 (Print) 1522-9602 (Online). von Bertalanffy, L. 1968. General System Theory: Foundations, Development, Applications. George Braziller Inc. New York.